6-foot-6 LHP Kyle Muller topped at 90 mph at Wrigley Field during the 2015 Under Armour All-America Game, just one tick off his top bolt of 91 the first time we saw him in November 2014 at the Under Armour Futures Texas Showcase. We first saw Muller in early November 2014 at the Under Armour Futures Texas Showcase, where he showed as a talented two-way player. Kyle is a tremendous 2-way player with huge upside. On the mound, his imposing 6’5″ frame works well in a balanced, coordinated delivery. His arm action is clean and full and his crossfire delivery makes picking up the ball difficult for hitters. He throws his fastball into the low 90s and does a very good job of confidently pitching inside to RHHs. He also has excellent feel for his change and spins a traditional curve. He flashes a harder breaking ball that is more of a slider as well. As a position player, Kyle has a strong right-handed stroke with quick hands and good use of his lower half. He also is smooth around the bag and shows his athleticism as a defender. Overall, Kyle is a special player. 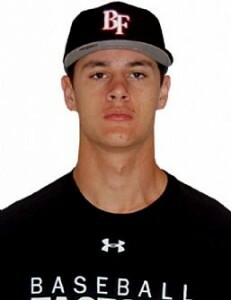 He is a big, strong athlete (6.88 in the 60) with an impressive all-around game though his highest ceiling looks to be as a LHP.